80% of the UK’s capercaillie live here in the National Park. A male capercaillie is one of nature’s most magnificent sights and unfortunately one that is perilously close to becoming a memory. The turkey-sized capercaillie (Tetrao urogallus) is one of Scotland’s most characteristic birds. The males perform an extraordinary courtship display called a lek. While fanning their tails and holding their wings down the males strut about at their traditional lek site and produce amazing gurgling, wheezing and popping noises. Within the UK, Capercaillie occur only in Scotland and mainly in suitable forest habitat in Badenoch and Strathspey. The species is believed to have become extinct during the 18th century and birds of Swedish origin were re-introduced during the 19th century. In the early 1970s it is thought there may have been around 20,000 birds, but by the time formal surveys began in the early 1990s, numbers were found to have declined to around 2,000 birds. The last national estimate was of just over a 1000 birds and it was predicted that they would be lost in Scotland by 2014 unless urgent action was taken. Private and public land managers have worked exceptionally hard and in Badenoch and Strathspey at least, the population seems to be holding its own. 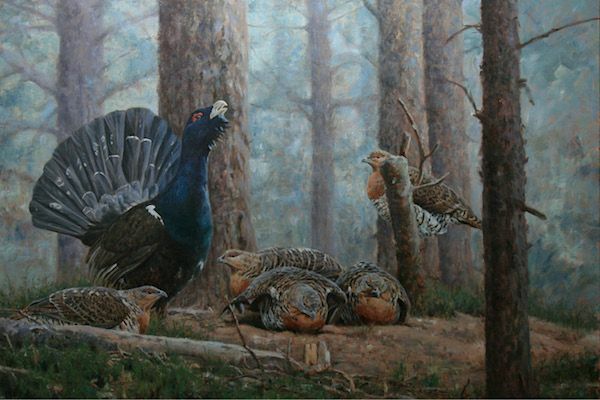 Capercaillie require large areas of forest to survive. Work carried out to benefit capercaillie is likely to benefit a wide range of other native species that live in the same habitat. Although the dramatic decline towards extinction has been halted, the capercaillie remains one of Britain’s most threatened species. To find out more about the work going on to save capercaillie, click the “action” tab on the right.